Reed & Barton "Burgundy" Pattern Sterling Silver Flatware Service, Massachusetts, 20th century, twelve each: teaspoons, dinner forks, soupspoons, salad forks, and hollow dinner knives, and ten spreaders, approx. 88.2 troy oz. 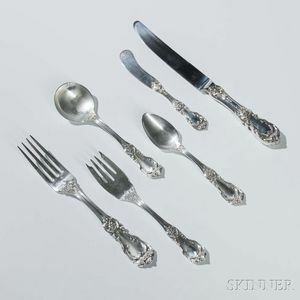 weighable silver, together with a group of silver spoons of a different pattern.